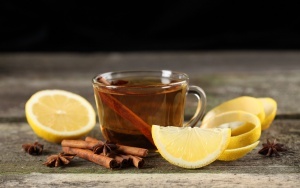 Beat the Bloat for Good with this Incredible Miracle Morning Tonic! Feeling sluggish, bloated and uncomfortable? Fear not! I have the perfect “antidote”. This Miracle Morning Tonic is a simple and highly effective way to cleanse, repair and energise the body. This is something that I drink every single morning as I wake up, and I absolutely swear by it! Even if I am on holiday I will make sure to bring along my special ingredients so that I can enjoy the benefits of this miraculous drink. Although this concoction may at first glance appear to be something that you would rather not drink….like ever, I can assure you that it truly works wonders for keeping the gut healthy and happy. You will see and feel the difference within just a few days, after which you will never want to miss a morning without your Miracle Morning Tonic. The powerful combination of these detoxifying ingredients (listed below) work together to cleanse the gut, promote digestion, eliminate bloating and boost the metabolism. 1 litre boiled spring water – please make sure this is spring water! Boil spring water and allow to cool for a few minutes. Do not add water immediately after boiling as this will burn the spices. I like to make a 1 litre jug which lasts up to 4 days if refrigerated and stored in a glass jar. Allowing these healing ingredients to soak in the water for a good amount of time is even more beneficial, as all their healthful properties are absorbed into the water. For every serving, simply warm a mug full of the liquid in a small pot on high heat until liquid begins to boil. Please use a stove for heating, no microwaves, as these destroy all the goodness of the ingredients! Remove from heat, allow to cool slightly and enjoy! When should I drink this? For the best results, make sure that you drink your Miracle Morning Tonic as you wake up, first thing in the morning, on an empty stomach. And voila! There you have it. Your metabolism boosting, bloat curing, gut cleansing, body detoxing Miracle Morning Tonic! Go on…try it out..a new morning ritual that will do you wonders!